Spinach dip is positively addictive, especially when you pair it with a nice round of pumpernickel, sourdough, or Hawaiian bread. It even goes well with toasted pita chips if you prefer a little crunch. Classic spinach dip is probably the most popular, but there are other tasty variations that you simply have to try. 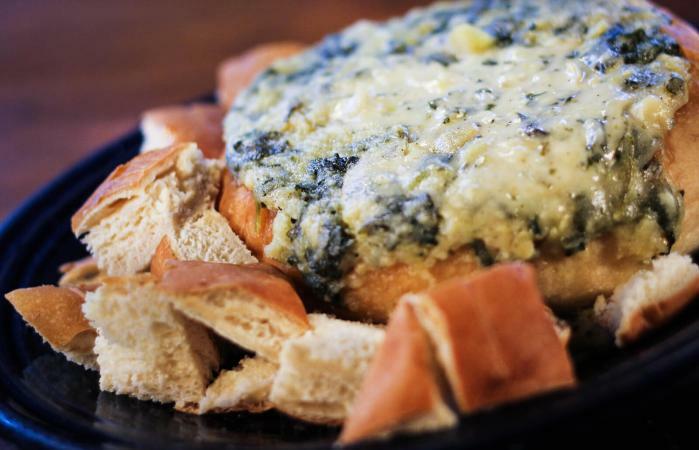 This is the traditional spinach dip that most people know. It's creamy and chock-full of spinach and complementary ingredients that usually prove to be an irresistible combination. This recipe yields about one quart of dip, but you can double it if you need more. Put the spinach in a colander and press it to squeeze extra water out of it. Set it aside to let it drain. In a medium-sized bowl, stir the sour cream, mayonnaise, and ranch dressing mix together. Add the spinach, water chestnuts, carrots, green onions, and parsley to the sour cream mix, and stir well. Chill the dip for about two hours and serve it with pumpernickel or Hawaiian bread. 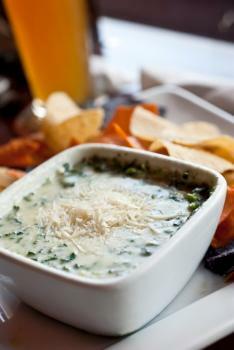 Chive cream cheese gives this spinach dip a rich flavor and texture. This recipe yields approximately two quarts of dip, so you'll have plenty for everyone. Put the spinach in a colander, and press it to remove the water. Set it aside to continue draining. In a large sauté pan, melt the butter over medium heat. Add the onions and cook them until they just begin to turn translucent. Reduce the heat to low and add the cream cheese and sour cream. Stir slowly until the cheese melts and combines with the butter and onions. Stir in the spinach and lemon juice (if you want it) until they're completely blended with the cheesy base, and sprinkle with a little salt and pepper to taste. Pour the dip into a serving dish and sprinkle the Parmesan on top. Serve warm with fresh bread, toasted pita chips, or tortilla chips. Here's a dip that artichoke lovers will want to try this warm and creamy dip. This recipe makes about a quart of finished dip. Chop the spinach and artichoke into small pieces. If using frozen spinach, make sure it is thawed and dried before using. Mix all the ingredients together in a bowl and then transfer to a baking dish. Bake for 20 minutes or until bubbly. Serve warm on toasted bread squares. Make this dip the night before so the bacon flavor has time to work its way through the dip. This recipe yields approximately two quarts of dip. Drain the spinach in a colander. In a large bowl, combine the sour cream and mayonnaise, and stir well. Add the spinach, onion, feta, bacon, and banana peppers, and stir until well combined. Chill at least two hours, but overnight is even better. Serve with pita bread. These recipes are delicious, but you can also think of them as a starting point for your own ideal dip. Feel free to increase the amount of sour cream, mayo, or cream cheese if you prefer an even creamier texture, or experiment with different vegetables and seasonings. 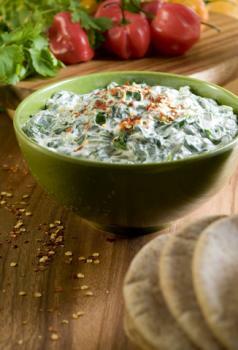 Think of spinach dip as your go-to dip for parties or any time you want a special treat to snack on.